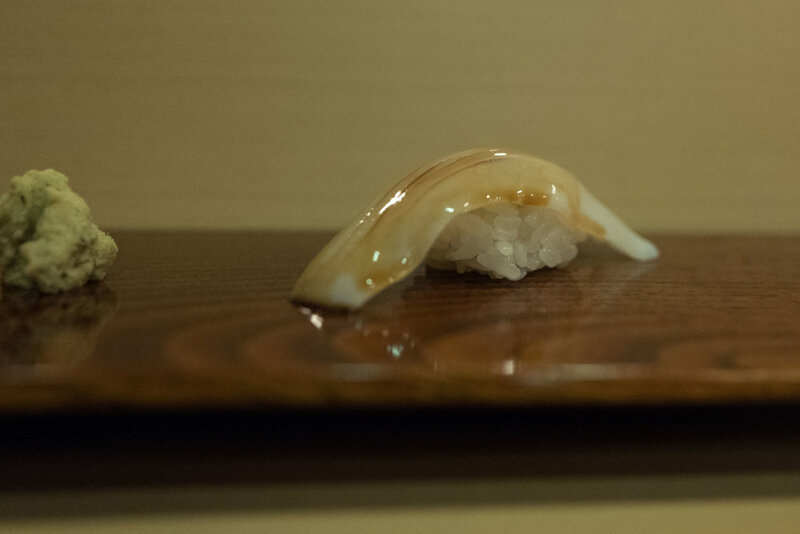 Kozasazushi is not an easy restaurant to write about. It is extremely difficult to find much useful information about this shop in English. But, from what I gather, this is a very famous restaurant with a lot of history. It first opened in 1950 with master Okada Shuzo-san at the helm. I believe originally the shop was located somewhere around Nihonbashi and relocated to its current home in Shimbashi several decades ago. 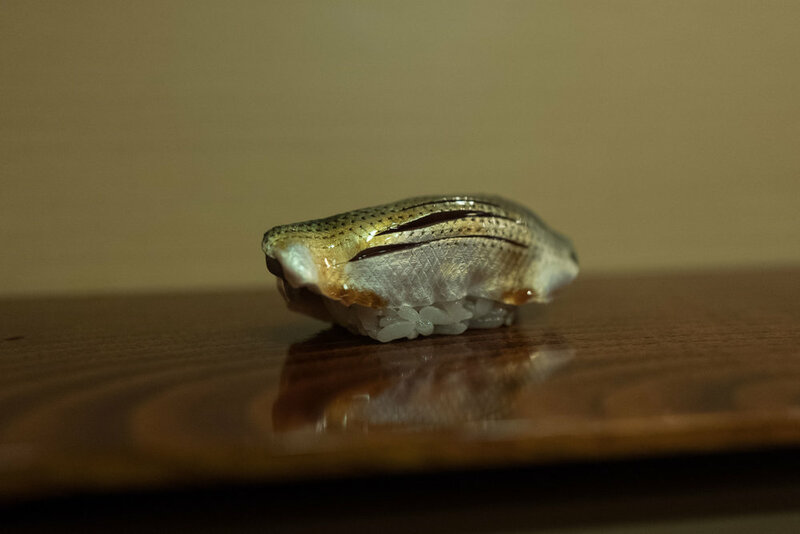 It was considered for a long time to be one of the most important sushiya in Tokyo, and somehow in the last decade or so it seems to have fallen out of favor with Tokyo's sushi mavens. The shop still has a very respectable 3.91 score on Tabelog, but you just never hear anyone talk about this place on social media or food blogs - possibly because the majority of its regular customers are a bit older than the Instagram crowd. Ultimately, the lack of social media hype regarding this shop made it all the more enticing to me. It might not be the most trendy or popular of sushiya at the moment, but that doesn't mean that this shop isn't still doing good business. The restaurant was full during my recent lunch visit, and all of the customers appeared to be regulars. Well, except for the loud, drunk English businessman being entertained by his Japanese counterpart. 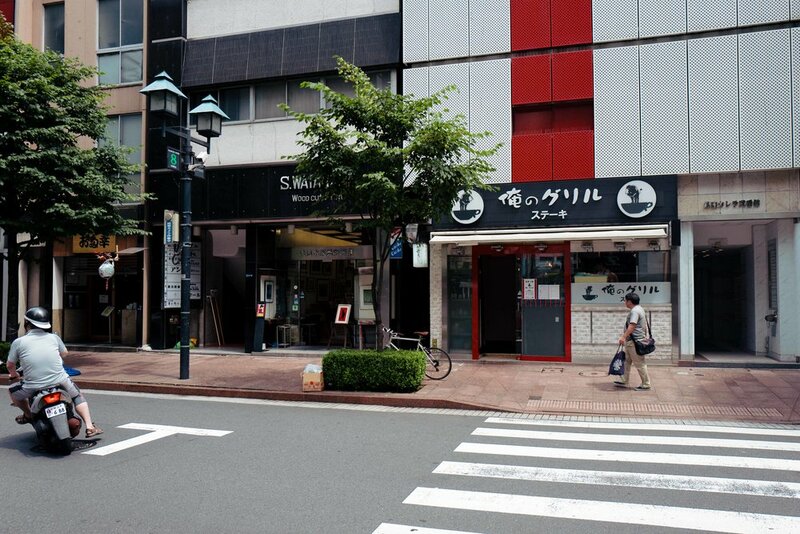 Technically, the shop is located in Ginza's 8-Chome, in the southwestern part of Ginza. It's only a few blocks away from Shimbashi station, and most Tokyoites refer to it as being located in Shimbashi. It is another one of those hard-to-locate shops, tucked away in one of the narrowest alleys I've ever seen. Notice the parked bicycle in the photo on the left. 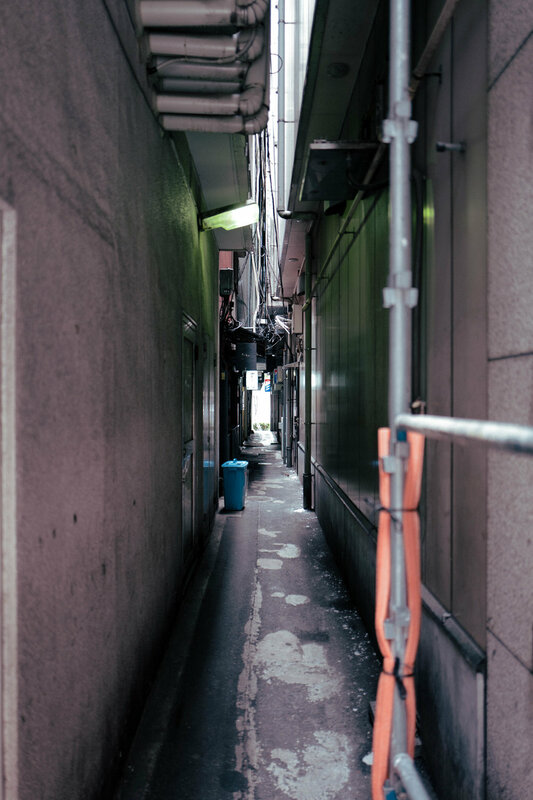 Behind it is an extremely narrow alleyway. Enter the alley (center photo) and make you way to the halfway point, and there it is - the entrance to the shop, as shown on the photo on the right. Step inside, and you'll find a nice, rustic 10-seat counter manned by two elderly sushi chefs. My chef, whose name I did not get, was very amicable and spoke English well. I ordered the lunchtime "nigiri only" omakase set which consists of about 15 pieces of nigiri and is priced at a reasonable ¥11,500. Of course I requested a kanpyomaki at the end, because visiting such a classic sushi shop requires a classic end to the meal. And indeed, the sushi at Kozasazushi is as classic as it gets. Large pieces of neta are paired with komesu (rice vinegar) seasoned shari. The rice is on the softer side, quite cool temperature-wise, and seasoned with salt and a bit of sugar. (Disclaimer: I assume this based on taste, but could be wrong). The shari is the weak link; it is not sour enough for my personal taste, and the cool temperature further diminishes the impact of the vinegar. However, considering the affordable price-point (¥11,500 puts Kozasa firmly in the "mid-range" price bracket) I found the neta to be of good quality. The kohada, the aji, and the shellfish pieces were especially delicious. All in all, my lunch at Kozasazushi turned out to be quite enjoyable. They offer good, classic sushi priced reasonably and served in an old-school, friendly environment. Sure, there is better sushi to be found elsewhere in Tokyo, but in my opinion Kozasa is still worth a visit. Below you will find photos of some of my favorite items, along with some additional comments. 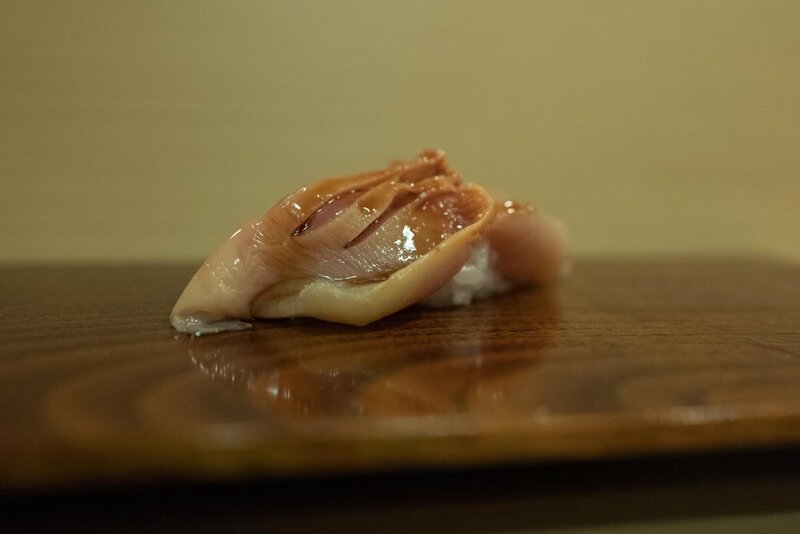 Kawahagi (本皮剥 / thread-sail filefish) with its own liver on top. Very good piece. My chef asked me about my favorite neta, then proceeded to serve me two pieces of kohada after finding out that it is my favorite. Such a lovely gesture! The kohada was delicious. The akami zuke (left) and toro (right) were quite good. You'll notice they're quite dark, so I assume that the tuna's flesh was beginning to oxidize. This had no discernible effect on the flavor. The aji was very good. 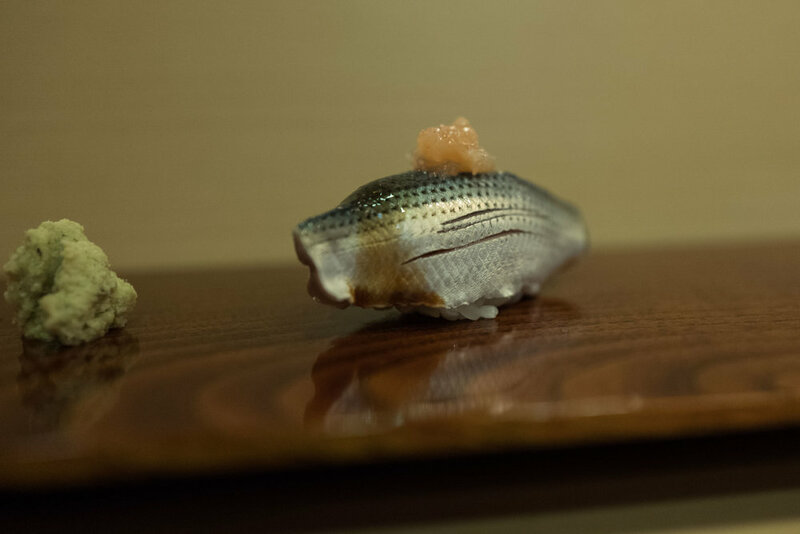 The hamaguri (left) was served with a very good, thick and sticky tsume. It was one of the standout pieces, along with the ni-ika (center) and akagai (right). The appearance of the sushi is as rustic as the shop itself. The wonderful flavor of the grilled anago more than made up for its slightly sloppy presentation.